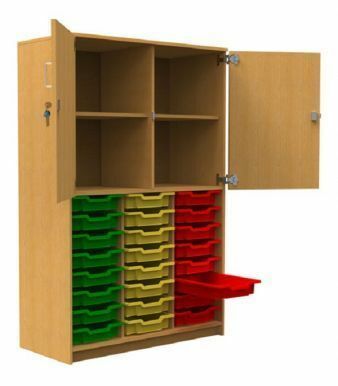 Ideal for use in teaching spaces this combination tray storage unit is supplied with 24 shallow Gratnell trays to the lower section and four compartments to the upper section. Doors are available in six finishes are lockable for extra security. The carcass comes in a choice of three finishes: Oak, Beech or Maple. Delivered free to the UK mainland assembled.